Zhuangzi would probably have laughed himself silly, watching the frenzy with which we compete for personal profit in the post-industrial era. He highly prized a good sense of humor. If only for a moment, laughter releases us from the rationality which dominates our calculating lives. Once we are released from the dictatorship of rationality, we are free to "go along with things." Whereas Confucius places emphasis on human relationships, the Daoists rejoice in nature, and particularly the mysterious Dao, which is manifested through our natural surroundings. For Mencius, Buddha and Aristotle, the role of the mind is critical in the quest for happiness. The Daoists on the other hand, argue that we think too much, for it is our rational mind that has led us away from the intuitive Dao. Zhuangzi, who was born about 2,300 years ago, during the tumultuous Warring States Period of ancient China, probably wrote the first piece of work in history devoted to happiness. This essay, which is called "Supreme Happiness" (Watson, 2003), is now a chapter of the book named Zhuangzi, after the author. 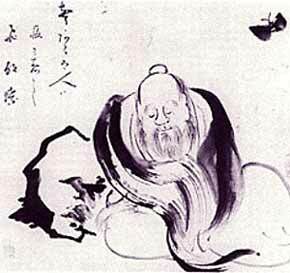 For Zhuangzi, a humorous and self-deprecating follower of Laozi, the Old Master, ultimate happiness is nothing but wuwei, the skill of doing nothing against the "Way" (Dao). Zhuangzi draws a clear distinction between two kinds of happiness. Most people value wealth, fame, and physical comfort, through delicious tastes, beautiful colors, attractive clothing and music. Once they dip their toes in these fleeting joys, they try to obtain more, and become uneasy if they cannot do so. Yet the Dao, a mysterious power which fills the cosmos and is reflected in the workings of nature, is the source of a much deeper form of happiness. We humans, who dwell in the midst of nature and are part of the Dao itself, only need to harness this power. This is similar to sitting in a car with a powerful engine running, while the gear is locked in neutral. We need to know how to get the car in gear. This is done through the practise of wuwei, which Zhuangzi often refers to as the skill of "going along with things," or as we say nowadays, "going with the flow." Talking about "flow," Zhuangzi compares the wise person or sage to an expert swimmer, who can survive a powerful torrent by freely swimming with it. In The Dao of Pooh Benjamin Hoff compares the Daoist sage to Winnie the Pooh, who doesn't know how to calculate profit and loss, but lives in the moment and finds contentment in simple things. Pooh doesn't like meddling and "monkeying around," and things simply seem to work out. And yet many of Zhuangzi's sages are not born with this sort of virtue, but achieve it through a great deal of focused effort in the exercise of their unique skills. 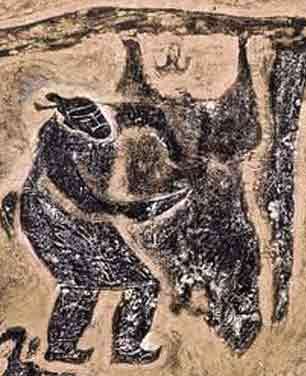 Butcher Ding depicted in a Han Dynasty tomb mural. Butcher Ding, for example, achieves happiness by perfecting the skill of chopping up ox carcasses. This was one of the most despised professions in ancient China, and yet Ding goes about his work with great pride and pleasure, claiming that the more skillful he gets at chopping meat, the more skillful he gets at "going along with things" and harmonizing with the Dao. Sages like Ding and the cart maker, P'ien, have no interest in academic learning, as they think words are not a very efficient way to discover the Dao and obtain genuine happiness. By following the practise of wuwei and drawing closer to the Dao, blue-collar sages like Ding and P'ien obtain De or virtue, which is itself a sort of indescribable power, and is clearly quite different from the virtues of the Confucians or Platonists. An equally popular way of obtaining peace of mind among Daoists, and especially religious Daoists, is through special breathing techniques. These techniques are probably the origin of qigong practices in Taiji, which focus on the cultivation of qi, a vital energy that fills the body. It is quite possible that Daoist breathing techniques emerged from Indian yoga, which uses them in combination with various postures for the attainment of bliss. Zhuangzi. (1968). The Complete Works of Chuang Tzu (B. Watson, Trans.). New York: Columbia University Press. Watson, B. (2003). Zhuangzi: Basic Writings. New York, Chichester, West Sussex: Columbia University Press. Ivanhoe, P. J. (1993). Zhuangzi on Skepticism, Skill, and the Ineffable Dao. Journal of the American Academy of Religion Vol. 61, No. 4 (Winter), 639-654.